Meet Autumn Buatala and her son Elliott. Autumn is the fourth family to be served in the Aurora community. Autumn partnered with Habitat to freshen up a home that was made available by a previous Habitat homeowner. Just like every other partner family, Autumn put in at least 200 hours of sweat equity before she and her son moved into their home in October. 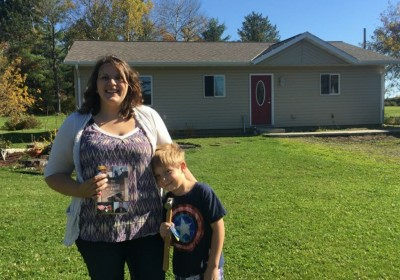 Autumn and her son have happily settled into their new home and a new and exciting chapter in their lives! To get weekly updates on this home and the other current projects, sign up for our weekly email updates by clicking here, emailing Susan Garrett at susan@nslchfh.org, or by calling the office and we will sign you up.